It is a subcutaneous muscle present under the chin that overlies the sternocleidomastoid. It belongs to the group of cross-striated musculature. It usually occurs as a pair of a broad sheet of muscles on either side of the anterior neck. It originates from the pectoral (chest) through to deltoid (shoulder) muscles. It arises from the fascia overlapping the pectoral muscle at the chest and deltoid muscles of the shoulders. It further rises over the collarbone/clavicle and proceeds upward in a slanting manner along the sides of the neck. The muscles help in the drawing of the lower lip sideways and enabling the corner of the mouth to go down, thereby allowing partial opening of the mouth. The platysma helps and increases the diameter of the neck when the fibers are active to the maximum level. The platysma is a muscle that is connected directly to the skin. No other muscle in the body is directly associated with the skin. It covers the front sides of the neck. The direct insertion of the muscle to the skin lets it chance the facial expression of a person, thereby leading to the changes in other facial muscles as well. Behind and below the symphysis menti, which is the external surface of the mandible, the fibres of the anterior and posterior regions of the muscle sheet interconnects and crosses the jawbone. It inserts into the inferior border of mandible and skin over the lower region of the face. Some of the fibres merge with the muscles at the angle and lower part of the mouth. The lip muscle of the oral cavity called zygomaticus as well as the margin of the orbicularis oris is also distributed with the fibres of the muscle sheet. 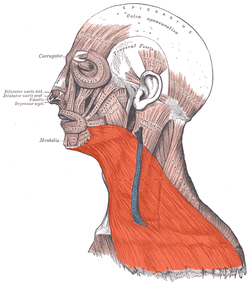 The external jugular vein descends from the angle of the mandible to the clavicle underneath the broad muscle. The distribution of the muscle over the face, clavicle, and shoulder often undergoes variations. It may either be absent or interlocked with the muscle of the opposite side in the anterior region of the neck. In some cases, the fibres are anchored to the clavicle, mastoid process or occipital bone. A slender bundle of fibres of the occipitalis minor may extend from the fascia over the trapezius to the fibrous tissue overlying the sternocleidomastoideus. It is normally innervated by the cervical branch of the facial nerve. The nerves to platysma are efferent and afferent. The efferent nerve constitutes the cervical branch of the facial nerve (VII) while the afferent nerve constitutes the transverse cervical nerve, C2 and C3. The blood supply to platysma muscle takes place through a superior thyroid artery, a submental branch of the facial artery, superficial cervical artery, and internal thoracic artery’s upper sterna branches. 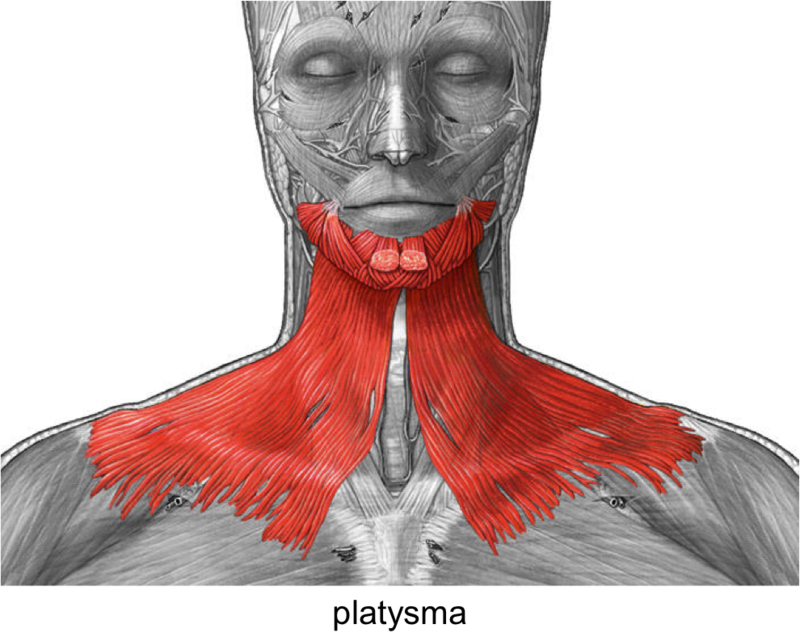 While in action, the broad muscle pulls the lower lip and corner of the mouth sideways and down to change the facial expression when an individual is in an emotional state. It also depresses and wrinkles the skin of the neck, a common sign of ageing, and helps in the lowering of the mandible. The muscle increases the diameter of the neck during the intensive breathing when all the fibres work in coordination. The flap of the muscle is often used to correct defects on the lower face, buccal mucosa, and floor of the mouth. 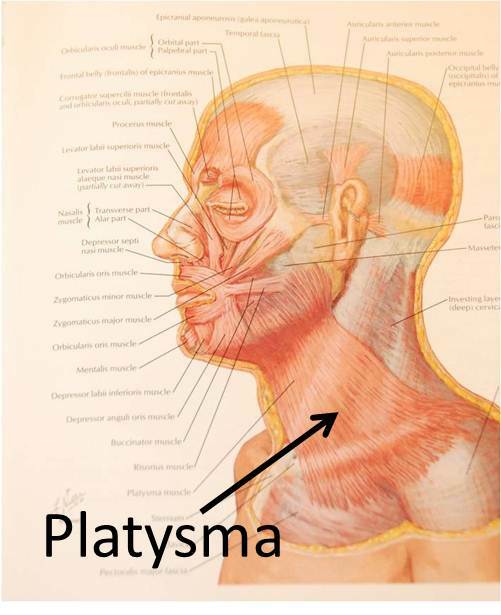 The platysma muscle is normally innervated intensely as it is seen in case of tongue and even muscles. Thus, the damage to the muscle causes dysfunction of the facial expression, thereby leading to paralysis, including masklike face or amimia. “Turkey neck” is yet another issue that arises because of the platysma banding. It is commonly seen in women, thereby compelling them to go for cosmetic surgery. The sagging platysma appearance does not look good but then surgery is not only the option. You can opt for various exercises to keep your platysma muscle intact and in place, thereby improving your appearance without undergoing any kind of surgery. The muscle at the front of the neck can be tightened and toned down to prevent drooping chin, sagging jawline and loose skin under the chin. A range of motion workouts for the neck keeps the muscle sheets flexible and strong. Hanging head exercises as well as chin firm performed during the normal ageing process firm the regions around the jaw and neck. The right way of performing these exercises have been step-wise jotted down.